1 x Quick lock waterproof connector. 1 x In-line silicon/ceramic fuse holder &15Amp fuse. See Motech website and Cell Brochure for more details. See Terms and Conditions page for further details. EcoOnline is proud to offer this versatile solar charging kit. 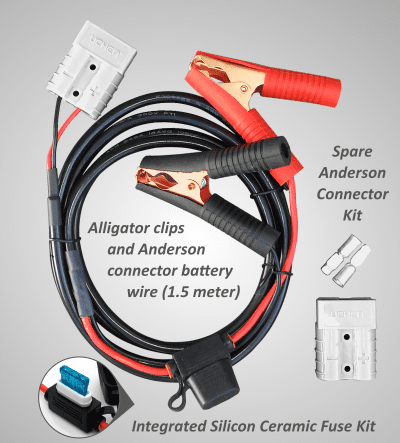 Includes a ChargeMasterPRO regulator with a complete list of electronic self-protection functions, a PV solar panel featuring premium quality brand name cells by MOTECH Industries with a 6 meter solar wire and snap lock waterproof connector, a 1.5 meter battery wire with standard Anderson connectors, alligator battery clamps and an integrated fuse kit, and a comprehensive EcoOnline safety, information and installation manual. * While any two differently sized ChargeMaster kits can be used to charge one battery, only two identical panels can be connected to ONE ChargeMaster regulator via our parallel connector or an in series 24V connector. 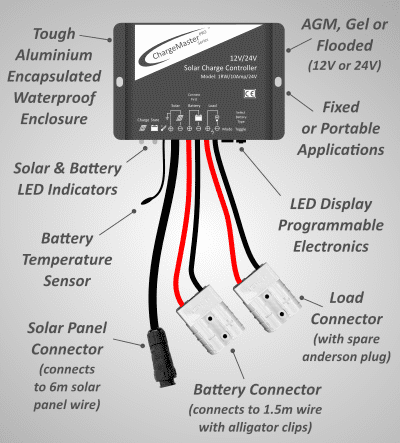 Swapping/Adding/Exchanging/Upgrading of course requires the purchase of extra panel(s) and/or ChargeMaster kit(s) and parallel/in-series connectors. The ChargeMasterPRO series of compatible pre wired** components is designed for maximum flexibility, upgrade ability and convenience in charging any Lead Acid, Sealed (AGM), Flooded or Gel battery. You can use the regulator with larger portable, or vehicle mountedpanel during a camping trip, then connect the regulator to a smaller externally mounted panel (sold separately) for battery storage / top up. If you find you need more power on your camping trips you can upgrade the kit later by purchasing a second ChargeMaster panel with compatible wire and parallel connector, or if you need even more power you can use two different ChargeMaster kits on the one battery, up to 240W power at 12Vor 480W at 24V. See installation manual for configuration details -EcoOnlineTM Install Manual. **Note, use of the regulators load function (see manual) will require the connection of the spare Anderson connector to your load wiring. Only use 12V “nominal” (36 cell) solar panels with this regulator. Or 72 cell panel(s) for a 24V system. 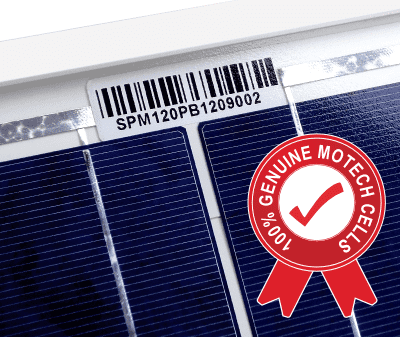 EcoOnline recommends solar panel wattages and connected loads should not exceed: 120W solar power (at STC for a 12V system) or 7.5Amp continuous load for the 10Amp regulator. This regulator is to be used for charging Sealed, Gel or Flooded Lead-Acid type batteries only. Not to be used for charging any other battery chemistries. Check that the maximum current produced by the chosen solar panel(s) array can never exceed the maximum allowable charging current for the battery being charged. Never exceed the rated Ampacity (amp rating) of a wire. Keep in mind that low voltage / high current wires situated in highly insulated environments cannot dissipate heat and will have a much lower Ampacity. For a shipping estimate, use the above calculator or just add this listing to your cart and click "View Cart" at the top right of this page, then "Estimate Shipping" on the cart page. The shipping estimated time of arrival (ETA) can be checked on our shipping calculator here. We ship from Melbourne Victoria.